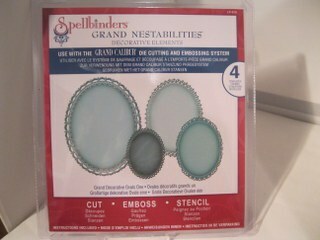 Spellbinders Grand Decorative Ovals are such a beautiful set of dies and they can be layered together for a pretty look to your designs. 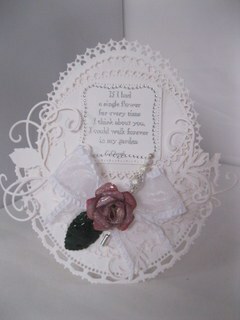 I will show you different ways to make a card that will certainly stand out from the crowd. There are four dies in this set and each one has a different pattern to the edge. They can be mixed and matched with any other Spellbinders that you may have in your collection and they can be used in so many different ways. was the first but there are many more using the same set of dies over and over in a multitude of ways. 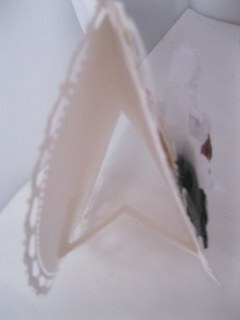 This is a very popular White on White card and there is no other colour in the design. And to create a card that uses the card stand try .. This card has the addition of a spot of colour and the flower is the subject of two more videos. 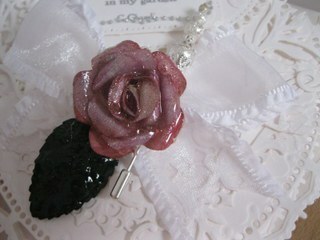 Then both the flower and the leaf have been Enamelled which gives them the appearance of glass. 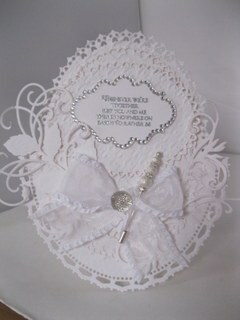 So there you have a beautiful card and some clever ideas of how to add that extra touch to any of your designs. Create cards that you will be proud to give and that will delight your recipient, and add your name to the back of them to promote the work that you have done.